Big data: Everyone seems to be talking about it, but what is big data really? How is it changing the way researchers at companies, non-profits, governments, institutions, and other organizations are learning about the world around them? Where is this data coming from, how is it being processed, and how are the results being used? And why is open source so important to answering these questions? There is no hard and fast rule about exactly what size a database needs to be in order for the data inside of it to be considered “big.” Instead, what typically defines big data is the need for new techniques and tools in order to be able to process it. In order to use big data, you need programs which span multiple physical and/or virtual machines working together in concert in order to process all of the data in a reasonable span of time. Getting programs on multiple machines to work together in an efficient way, so that each program knows which components of the data to process, and then being able to put the results from all of the machines together to make sense of a large pool of data takes special programming techniques. Since it is typically much faster for programs to access data stored locally instead of over a network, the distribution of data across a cluster and how those machines are networked together are also important considerations which must be made when thinking about big data problems. Big data is a broad term for data sets so large or complex that traditional data processing applications are inadequate. Challenges include analysis, capture, data curation, search, sharing, storage, transfer, visualization, and information privacy. The term often refers simply to the use of predictive analytics or other certain advanced methods to extract value from data, and seldom to a particular size of data set. Accuracy in big data may lead to more confident decision making. And better decisions can mean greater operational efficiency, cost reductions and reduced risk. Analysis of data sets can find new correlations, to “spot business trends, prevent diseases, combat crime and so on.” Scientists, practitioners of media and advertising and governments alike regularly meet difficulties with large data sets in areas including Internet search, finance and business informatics. Scientists encounter limitations in e-Science work, including meteorology, genomics etc. 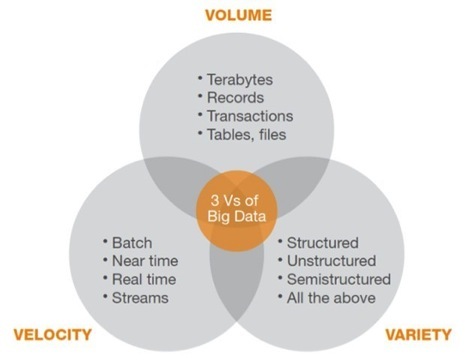 Big data usually includes data sets with sizes beyond the ability of commonly used software tools to capture, curate, manage, and process data within a tolerable elapsed time. Big data “size” is a constantly moving target, as of 2012 ranging from a few dozen terabytes to many petabytes of data. Big data is a set of techniques and technologies that require new forms of integration to uncover large hidden values from large datasets that are diverse, complex, and of a massive scale. Volume – The quantity of data that is generated is very important in this context. It is the size of the data which determines the value and potential of the data under consideration and whether it can actually be considered Big Data or not. The name ‘Big Data’ itself contains a term which is related to size and hence the characteristic. – Business Intelligence uses descriptive statistics with data with high information density to measure things, detect trends etc. -Big data uses inductive statistics and concepts from nonlinear system identification to infer laws from large sets of data with low information density .